Dame Christine’s career started in the Probation Service and she became Senior Education Adviser for the Home Office, managing and co-ordinating education policy and provision in 43 Midland prison establishments. She went on to work at Dudley College as Deputy Principal, then Principal and Chief Executive of Matthew Boulton College (and afterwards Birmingham Metropolitan College when Matthew Boulton College merged with Sutton Coldfield College). Christine is the first female member of the Birmingham and Solihull LEP Board. She is a past President of the Birmingham Chamber of Commerce Group. 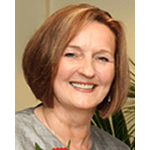 Christine is a Council Member of CBI West Midlands, a Council Member of Aston University, an Officer of the 157 Group and was previously Deputy Chair and Director of Birmingham Forward, and Chairman of Birmingham Children’s Hospital NHS Foundation Trust. She was appointed a Dame Commander of the Order of the British Empire for services to education in the 2013. Christine was High Sheriff in 2013/14.